Last week we discussed the limitations of project-based design and manufacturing. This week we will look at strategies to assist companies transform their operations to a product-focused business while still realizing significant benefits. This is the moment when a company must make a choice. I have worked for many successful organizations—from $10M small operations to $500M enterprises—that have experienced the project-focused dilemma. Do they remain a purely project-based company or reinvent themselves? Can they make the transition? Are they able to rethink their delivery strategy and become a product-based enterprise? This choice doesn’t require them to shift from developing customized solutions for their clients to acting as a pure-play commodity manufacturer. On the contrary, it is possible evolve to a middle ground. 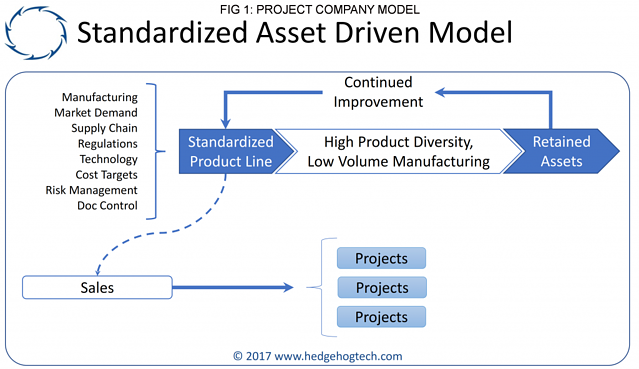 The new model emphasizes a standardized process-based approach and enables the transformation to “high product mix, low volume” based manufacturing company. This new model may seem unrealistic if the conventional wisdom is that your market will not tolerate standardization and simplification, and that everything must be a custom solution. But I don’t believe that to be the case. I have helped multiple companies improve their organization and make the cultural shift to product focus—while still delivering excellent project results. Doing so has helped them extract value from the business in the form of higher margins and happier customers. And, in the process, they are growing their asset base. Organizational transformation requires work and persistence. It is challenging to work through the process while still delivering on the current pipeline but it can be done. The process requires rigour and buy-in throughout the organization, but by following a few fundamentals a transition is possible. Before embarking on the transformation, it is critical that that senior leadership develop a strategic plan focused on desired outcomes. What does the organization wish to become? What are the objectives? Set targets and communicate throughout the organization. For example, does the organization want to issue an IPO, increase revenue for shareholders, become a leader in their industry, or simply stop the intellectual leakage of projects? Identify the key drivers and develop appropriate metrics to measure progress. Assess how the company is organized and change if necessary. The success of any plan will depend on management buy-in. The team must believe in and understand the strategic plan. Their role to achieve the plan must also be clear—they must know what they are accountable for and how success will be measured. Time must be spent up front to ensure that each department is aware of their role in the organization’s success. If there are resource gaps or capacity issues then a resourcing and training scheme must be part of the implementation plan. The next step is to develop a product roadmap. A product roadmap is more than simply coming up with technologically innovative ideas. A roadmap must identify where related technology is going and how the organization will respond. The response will depend on a set of clear priorities that must be identified through the transformation process. The roadmap must factor institutional capability and incorporate inputs from Manufacturing, Market Research, Supply Chain, Regulations, Development Risk Management and Cost. Measuring success is the key feedback required to ensure the plan is working. Setting the right KPIs is even more important. Take the time to determine what success means at all levels of your organization from the corner office to the shop floor. Knowing what to measure and how to appropriately provide feedback are critically important. Set clear performance goals for each department and for the organization as a whole and communicate the results. Create a unified and centralized systematic workflow for the entire product life cycle. Simple concepts like document control, product naming schemes, and consistency across the supply chain will enable an organization to accelerate its growth and focus on improving products, as opposed to spending resources on maintenance of existing systems. Focus on engineering process and quality. Wherever possible, standardize at the system and subsystem components level. Design based on set of standardized functional solutions. Build upon an existing product solution but don’t change for the sake of change. Design decisions should be based on minimizing skews and applying a standardized approach to problems similar in nature. When developing a product line from existing work, one simple strategy is to seek sameness in all components and group systems and subsystems together based on function. Simply adopting this design philosophy results in reduced inventories, huge supply chain synergies and faster design turnaround, while still maintaining customer-based configuration and customization. Finally, establish alignment across the organization based on this high-mix low-volume approach. This is particularly important as it relates to the sales force and the supply chain. Product platforms can retain significant configurability without departing from the base core platform. The benefits of the product model for project based companies are numerous. The company can stabilize its cash flow through product management. Products allow the company to specifically assess the exact cost of each subassembly and system. The costs can then feed the sales and value proposition to the customer. Instead of significant uncertainty, it is possible to pitch exact costs, allowing for more competitive and increased sales. Products help to eliminate silos, as they require cross-functional collaboration to succeed. Finally, when the company is evaluated, a product focus ensures the corporation has increasing assets clearly linked to cash flow.